The humble olive; bitter beyond words when plucked from the tree, but capable of an extraordinary transformation into the liquid gold of the Mediterranean after the ingenious pressing process. For millennia the olive tree and its fruit have been symbols of life in the hot climes of Southern Europe and the Mediterranean. For many Brits and Northern Europeans it is often synonymous with ancient Greece and the Romans. Images spring to mind of toga-clad senators, picking at black olives in earthenware bowls at a corner taberna outside the Circus Maximus; a white haired philosopher reciting in the shade of an olive tree on a sun-scorched Greek island. The images are many and varied, but for many here the tending of olive trees and the oil they produce form an integral part of everyday life. A natural extension of the lifestyle of living off the land that has all but disappeared in the UK, but which still has many adherents here in Italy. Looking after olive groves, pruning and fertilising the trees, then harvesting the fruit, all adds up to a time consuming business. It is very labour intensive, so making a living solely from olive oil production is not an easy business. This is why many Italian families who keep their hectare or so of olive groves, only do so in order to produce enough for themselves and their children for the year. The going rate seems to be about 50 litres per family for the year (quite how they get through a litre a week is beyond me though…) Having been involved in selling Italian property for many years, I have been lucky to have a consistent supply of free, totally organic olive oil, from the many vendors and clients with whom friendships are formed. When you have just produced 500 litres of the stuff, the odd litre here and there to educate the ill-informed palate of a young inglese is not too much to ask I suppose. As with many aspects of country life here, the olive groves are tended by the older generation for the most part, with a visible lack of a passing of knowledge from one generation to the next. One rarely sees a youngster working on his family’s land these days. Aside from the subsistence nature of olive oil production, there is also fierce competition in certain areas to produce the best oil, not to mention the vehemently held belief that any oil produced outside one’s own area is invariably inferiore. 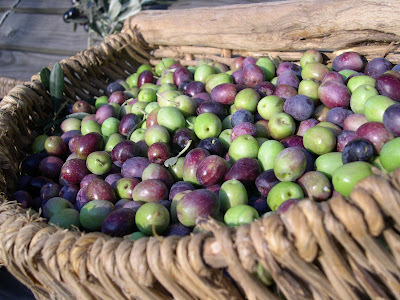 For example, the extensive fields of large and beautifully kept olive trees all along the north shore of Lake Trasimeno are renowned for producing exceptionally high quality extra virgin oil. Turn to discuss it with a local Cortonese however and you’ll most likely be cut short with a withering remark such as; “yes, but its Umbria; Umbrian oil is just not the same…” and so on in a similar vein. Our friend Louise has been consistently coming out top (or at least in the top three) of the Cortona competition for a few years now. She prides herself on the organic nature of her oil and even gives lectures on the subject of oil production and tasting. According to Louise the main criteria are balanced acidity, freshness and above all a leafy, grassy flavour. Contrary to what I had imagined, the piccante (hot, spicy) nature of the oil is not considered a quality to be measured. Anyone tasting that luridly green, brand new oil will recognize this; it is not like chilli pepper heat, but more like having bitten down on a black peppercorn, it really hits the back of the throat. We have a small olive grove by our house, with a total of about 30 trees, some of which are newly planted. Charlie’s father makes his yearly pilgrimage in October to undertake the harvest by hand, which usually takes him less than a day. The resulting quantity has risen steadily over the last few years and last year we reached the heady heights of 5 litres! I think this makes it the most lovingly produced, but probably also the most expensive 5 litres of oil in Tuscany… A trip to the frantoio (olive mill) close to Il Sodo is always a pleasure. We have far less than the required quantity of olives to have them pressed on their own, so we have been fortunate to press them with our friend Louise’s olives (thus ensuring we can always call our oil “award winning”). During the harvest season the mill runs long hours and we end up making an evening of it. There is a kitchen in the corner of the mill, with big fireplace, where people gather to cook sausages and eat bruschetta with the radioactive looking olio nuovo.